The LoaderInfo class provides information about a loaded SWF file or a loaded image file (JPEG, GIF, or PNG). LoaderInfo objects are available for any display object. The information provided includes load progress, the URLs of the loader and loaded content, the number of bytes total for the media, and the nominal height and width of the media. The contentLoaderInfo property of a flash.display.Loader object— The contentLoaderInfo property is always available for any Loader object. For a Loader object that has not called the load() or loadBytes() method, or that has not sufficiently loaded, attempting to access many of the properties of the contentLoaderInfo property throws an error. When you use a Loader object to load a display object (such as a SWF file or a bitmap), the loaderInfo property of the display object is the same as the contentLoaderInfo property of the Loader object (DisplayObject.loaderInfo = Loader.contentLoaderInfo). Because the instance of the main class of the SWF file has no Loader object, the loaderInfo property is the only way to access the LoaderInfo for the instance of the main class of the SWF file. 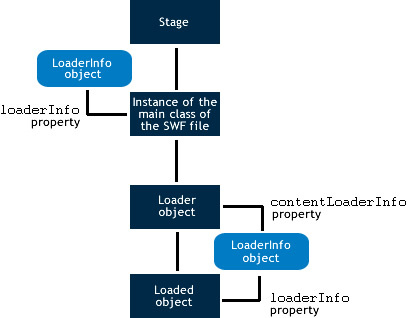 [read-only] The ActionScript version of the loaded SWF file. [read-only] When an external SWF file is loaded, all ActionScript 3.0 definitions contained in the loaded class are stored in the applicationDomain property. [read-only] The bytes associated with a LoaderInfo object. [read-only] The number of bytes that are loaded for the media. [read-only] The number of compressed bytes in the entire media file. [read-only] Expresses the trust relationship from content (child) to the Loader (parent). A object that can be set by the loaded content's code to expose properties and methods that can be accessed by code in the Loader object's sandbox. [read-only] The loaded object associated with this LoaderInfo object. [read-only] The MIME type of the loaded file. [read-only] The nominal frame rate, in frames per second, of the loaded SWF file. [read-only] The nominal height of the loaded file. [read-only] Indicates if the LoaderInfo.url property has been truncated. [read-only] The Loader object associated with this LoaderInfo object. [read-only] The URL of the SWF file that initiated the loading of the media described by this LoaderInfo object. [read-only] An object that contains name-value pairs that represent the parameters provided to the loaded SWF file. [read-only] Expresses the trust relationship from Loader (parent) to the content (child). A object that can be set by code in the Loader object's sandbox to expose properties and methods that can be accessed by the loaded content's code. [read-only] Expresses the domain relationship between the loader and the content: true if they have the same origin domain; false otherwise. [read-only] An EventDispatcher instance that can be used to exchange events across security boundaries. [read-only] The file format version of the loaded SWF file. [read-only] An object that dispatches an uncaughtError event when an unhandled error occurs in code in this LoaderInfo object's SWF file. [read-only] The URL of the media being loaded. [read-only] The nominal width of the loaded content. [static] Returns the LoaderInfo object associated with a SWF file defined as an object. The ActionScript version of the loaded SWF file. The language version is specified by using the enumerations in the ActionScriptVersion class, such as ActionScriptVersion.ACTIONSCRIPT2 and ActionScriptVersion.ACTIONSCRIPT3. Note: This property always has a value of either ActionScriptVersion.ACTIONSCRIPT2 or ActionScriptVersion.ACTIONSCRIPT3. ActionScript 1.0 and 2.0 are both reported as ActionScriptVersion.ACTIONSCRIPT2 (version 2.0). This property only distinguishes ActionScript 1.0 and 2.0 from ActionScript 3.0. Error — If the file is not downloaded sufficiently to retrieve the requested information. Error — If the file is not a SWF file. SecurityError — This security sandbox of the caller is not allowed to access this ApplicationDomain. SecurityError — If the object accessing this API is prevented from accessing the loaded object due to security restrictions. This situation can occur, for instance, when a Loader object attempts to access the contentLoaderInfo.content property and it is not granted security permission to access the loaded content. Note (iOS only): When running an application on iOS, the value returned is not the same as on other platforms. Expresses the trust relationship from content (child) to the Loader (parent). If the child has allowed the parent access, true; otherwise, false. This property is set to true if the child object has called the allowDomain() method to grant permission to the parent domain or if a URL policy is loaded at the child domain that grants permission to the parent domain. If child and parent are in the same domain, this property is set to true. Error — Thrown if the file is not downloaded sufficiently to retrieve the requested information. A object that can be set by the loaded content's code to expose properties and methods that can be accessed by code in the Loader object's sandbox. This sandbox bridge lets content from a non-application domain have controlled access to scripts in the application sandbox, and vice versa. The sandbox bridge serves as a gateway between the sandboxes, providing explicit interaction between application and non-application security sandboxes. SecurityError — Only content in the loaded content's sandbox can set this property. An HTTP redirect occurred while loading the content. The SWF file calling Loader.load() is from a different domain than the content's final URL. The SWF file calling Loader.load() does not have permission to access the content. Permission is granted to access the content the same way permission is granted for BitmapData.draw(): call Security.allowDomain() to access a SWF file (or for non-SWF file content, establish a policy file and use the LoaderContext.checkPolicyFile property). Note: The isURLInaccessible property was added for Flash Player 10.1 and AIR 2.0. However, this property is made available to SWF files of all versions when the Flash runtime supports it. So, using some authoring tools in "strict mode" causes a compilation error. To work around the error use the indirect syntax myLoaderInfo["isURLInaccessible"], or disable strict mode. If you are using Flash Professional CS5 or Flex SDK 4.1, you can use and compile this API for runtimes released before Flash Player 10.1 and AIR 2. For application content in AIR, the value of this property is always false. SecurityError — If the object accessing this API is prevented from accessing the Loader object because of security restrictions. This can occur, for instance, when a loaded SWF file attempts to access its loaderInfo.loader property and it is not granted security permission to access the loading SWF file. Expresses the trust relationship from Loader (parent) to the content (child). If the parent has allowed the child access, true; otherwise, false. This property is set to true if the parent object called the allowDomain() method to grant permission to the child domain or if a URL policy file is loaded at the parent domain granting permission to the child domain. If child and parent are in the same domain, this property is set to true. A object that can be set by code in the Loader object's sandbox to expose properties and methods that can be accessed by the loaded content's code. This sandbox bridge lets content from a non-application domain have controlled access to scripts in the application sandbox, and vice versa. The sandbox bridge serves as a gateway between the sandboxes, providing explicit interaction between application and non-application security sandboxes. SecurityError — Only content in the Loader object's sandbox can set this property. The file format version of the loaded SWF file. The file format is specified using the enumerations in the SWFVersion class, such as SWFVersion.FLASH7 and SWFVersion.FLASH9. The following example demonstrates the use of an uncaught error event handler to detect uncaught errors in an ActionScript project. The example defines an uncaughtError event handler to detect uncaught errors. It also provides a button that, when clicked, throws an error that is caught by the uncaught error handler. In the constructor, the code registers a listener for the uncaughtError event dispatched by the LoaderInfo object's uncaughtErrorEvents property. In the uncaughtErrorHandler() method, the code checks the data type of the error property and responds accordingly. The following example is the Flex equivalent of the previous example, using an MXML document instead of an ActionScript class as the root content. Returns the LoaderInfo object associated with a SWF file defined as an object. object:Object — The object for which you want to get an associated LoaderInfo object. LoaderInfo — The associated LoaderInfo object. Returns null when called in non-debugger builds (or when debugging is not enabled) or if the referenced object does not have an associated LoaderInfo object (such as some objects used by the AIR runtime). SecurityError — The caller is not running in the local trusted sandbox. Dispatched when data has loaded successfully. In other words, it is dispatched when all the content has been downloaded and the loading has finished. The complete event is always dispatched after the init event. The init event is dispatched when the object is ready to access, though the content may still be downloading. Dispatched when a network request is made over HTTP and an HTTP status code can be detected. All properties and methods associated with the loaded object and those associated with the LoaderInfo object are accessible. The constructors for all child objects have completed. All ActionScript code in the first frame of the loaded SWF's main timeline has been executed. For example, an Event.INIT is dispatched when the first frame of a movie or animation is loaded. The movie is then accessible and can be added to the display list. The complete movie, however, can take longer to download. The Event.COMPLETE is only dispatched once the full movie is loaded. The init event always precedes the complete event. Dispatched when an input or output error occurs that causes a load operation to fail. Dispatched by a LoaderInfo object whenever a loaded object is removed by using the unload() method of the Loader object, or when a second load is performed by the same Loader object and the original content is removed prior to the load beginning. The Event.UNLOAD constant defines the value of the type property of an unload event object. target The LoaderInfo object associated with the SWF file being unloaded or replaced. A property url is created, which is the location and name of the image. The class constructor creates a Loader object named loader. The loader object instantiates an event listener to ensure that the image loads properly. The constructor creates a new instance of a URLRequest object, request, with url passed so that the file name and location are known. The request object is then passed to the load() method of the loader object, which loads the image onto the display list. Important: This example requires that you add a file named Image.gif in the same directory as the compiled SWF file. Use an image that has an area that fits within the dimensions of the main SWF file.